Gorgeous bright sunny colours and I adore that sweet, smiling face. Isn't something cheerful like this just what we all need to see of a morning? 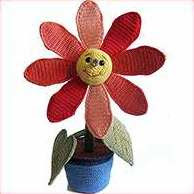 ~ There's heaps of other cute free and paid patterns at this site. Check them out. Glad you like it, Jan! Awww I completely fell in love with this one. I would love to make one for my niece. But sadly the link doesnt seem to work anymore? Any chance you would know where to find it?